Your photos are beautiful, as always. You achieve such wonderful effects with lighting and composition. I'm sorry you feel frantic - hopefully now that the post is up you'll be able to relax. No need to rush on our account. We are at your service. Thank you for the wonderful job you do hosting Mosaic Monday each week. Mary, what is the saying "no hurry no worry". I appreciate you taking your time to host your Mosaic Monday meme. I think we all have bad days. I hope your Photoshop problems are solved. Your images are beautiful, love the sky shot and the reflection in the door. Wishing you a great evening and week ahead. Sorry you are running into problems, but don't worry about the time. I know nothing about photoshop so I am of no help there. I for one truly appreciate your hosting this event each week. I don't always have something to contribute, but really appreciate your taking your time to host this event. I would not know where to start - You are appreciated. 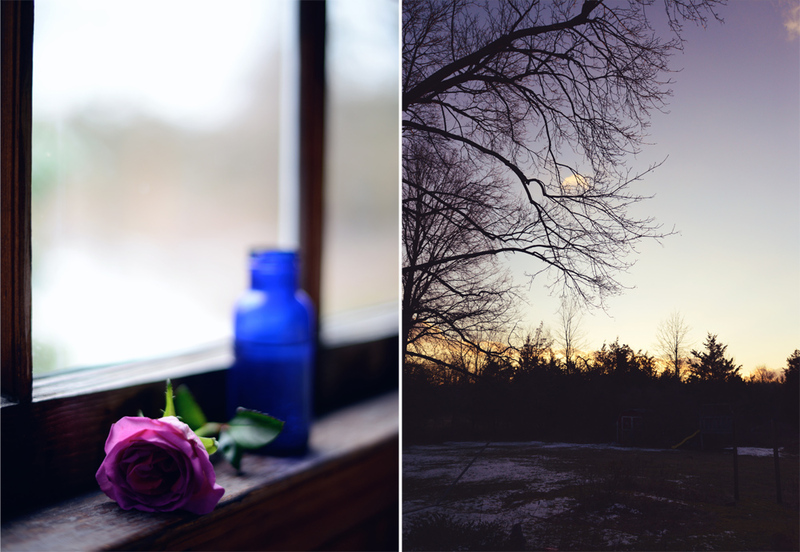 Love the cobalt blue bottle in the window with the rose - cobalt is my favorite shade of blue. Did you get a lot of snow in your area? Mary you are so dear to us now we hate to see you worry about your timing. You are always here for us sooner or later. I don't ever mind waiting. I have had a few frustrations with my Picmonkey. Congrats on the new camera. Thanks for hosting dear friend. Love the previous post with the plate on it. Well, your photos always look wonderful to me! Frantic or not, I'm certainly glad you're here! Thanks for bringing us all together on Mosaic Monday. no apologies for the rant needed. I am doing a "Lightroom" e-course - and there has been some ranting! Hopefully will get there in the end. 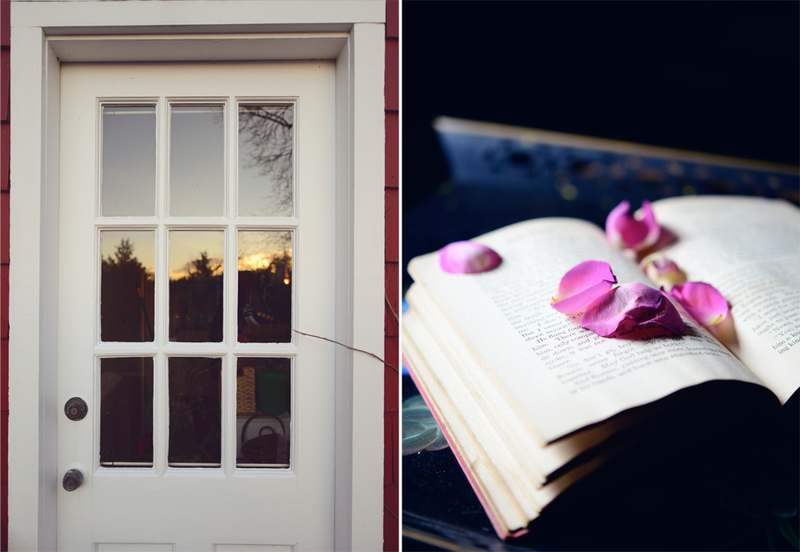 I love the gorgeous winter light in these photos, particularly of the rose on the windowsill and petals on the open book. Beautiful. Thank you for again hosting Mosaic Monday. Have a wonderful week - I hope you are away from the heavy snow falls and wild weather in the US. No apologies needed ~ Relax and enjoy ^_^ ~ Thanks for 'hosting' and your photography is beautiful! No worries Mary! Everything you do is always beautiful and so tasteful. We all have computer problems from time to time. I just bought a new iMac a few weeks ago and it's already in the shop being repaired. Now I wish that my old Mac had not died, but that's just the way life goes. Thank you for hosting and I hope the week ahead is a less stressful one for you. 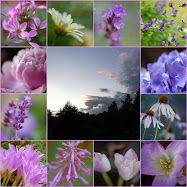 Your photos are delightful Mary! Oh, I so envy your new camera and your photography knowledge. Thank you for hosting us. I hope you are staying out of the storms. Hi Mary, love joining in. Thank you for hosting. Keep safe and warm. I think your mosaic is great! Now that I (finally) know how to make one, I need to join this party soon!! Hope you are not too cold - thank you for hosting, even if you are rushed off your feet - your photos were lovely. Beautiful mosaic Mary and very romantic and thought provoking. way. Thanks for hosting this Mary. Mary, your images are exquisite. Enjoy your new camera and thanks for hosting each week. My disc drive was full and really slowing me down. I purchased an external hard drive and moved all of my photos and videos there. They take up too much ram and storage. When I need a photo I just go to my external drive and use it and then send it back. I was having so much trouble with iPhoto and my Photoshop Elements. So, I thought it was time to do something else. I now use Adobe Creative Cloud, which lets me use whatever software I want including CS6 Photoshop and Illustrator. The version they have you download takes up less room on your hard drive. My computer has been acting much better. My Photoshop kept freezing because I had such a cluttered desktop and drive that there wasn't enough room to make any adjustments. Monday is a pleasure when a mosaic comes to mind. Thanks Mary for letting us share with you. Hope you have a good week. No matter how frantic the day turns out to be always try to look up at the sky in the morning and evening--and notice the odd moments of beauty or humor throughout the day. That's what I'm getting from your mosaic. Especially the "over your shoulder" shot of the light filled door. Hello Mary, I haven't got any mosaic to contribute with this week, just wanted to pop in and say hello :-) I can fully appreciate how deadlines sometimes are difficult to keep, I try not to set deadlines for my own posts as I would not manage to keep to them! Good luck with your new camera, I can highly recommend a huge external harddrive for all your Photoshop files and original pictures. I have kept on saving to DVDs and have almost 40 now. A nightmare at times when I want to go back and find a file I know I have. I have been looking at 'WD My Passport 2TB Portable Hard Drive', great review and no need for separate power. It's on my wish list! Sorry things have been difficult. I finally got an external hard drive to store my pictures, and that works quite well. thank you for the opportunity to share again.